Bogs, fens, and similar peatlands, as well as wet interdunal hollows. A species very distinct in its complete lack of pubescence, strictly entire leaves, long-peduncled aments, and bog habitat. 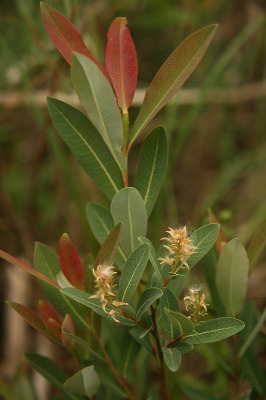 The leaves are strongly glaucous beneath when fresh, although the waxy layer may be lost in drying. MICHIGAN FLORA ONLINE. A. A. Reznicek, E. G. Voss, & B. S. Walters. February 2011. University of Michigan. Web. April 21, 2019. https://michiganflora.net/species.aspx?id=2634.